Hello! This is a disclaimer that this is be the post that never ends cuz it goes on and on my friend. So brace yourselves! Before you hit that red X up at the top. I have a recipe that was inspired by the appetizer from Kokkari during my trip to San Francisco. Well, I'm a little afraid to call it a recipe because it's just so simple and it comes together in a flash! 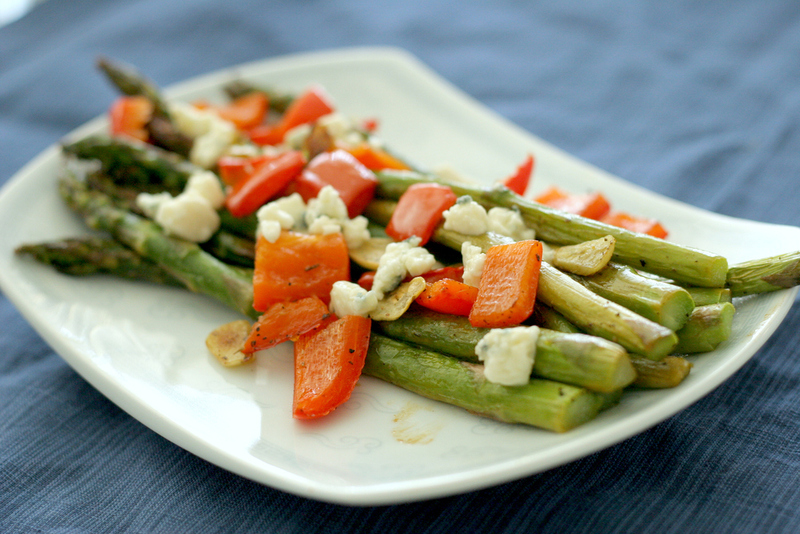 But I know that many of you are fond of all vegetables just like I am, including asparagus. I made this today as a side dish for lunch, and I thought that it was delicious! Quite healthy and refreshing. 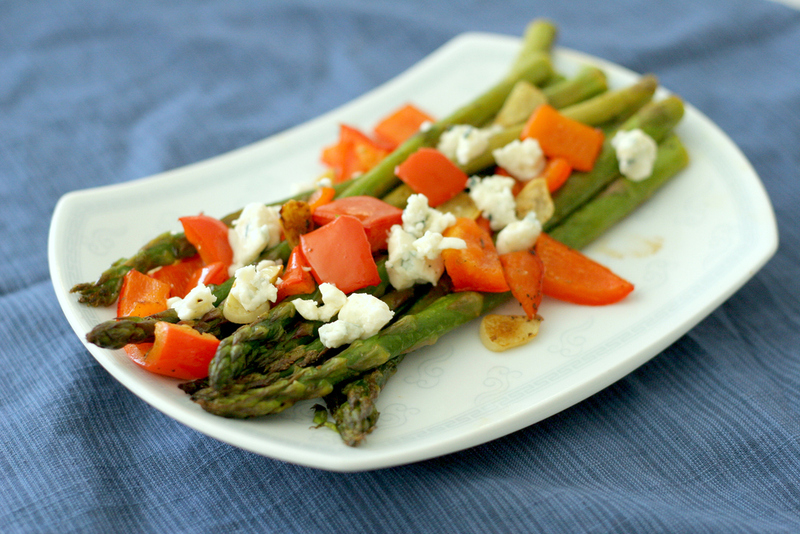 Place the asparagus, bell pepper, and garlic in a small baking pan/dish. Pour the oil and add the rest of the ingredients except for the cheese. Toss everything together until evenly coated. Bake at 450 F for approximately 15-16 minutes. It should be slightly brown on top. Once it's transferred to a dish, sprinkle the cheese on top. Then serve! Some of you may recall my recent review of Leah Sarago's Ballet Body workouts. I've been going through her routines about 3 times a week give or take, and so far I am a fan! So what exactly does Leah's methods do for my fitness? Well, first and foremost, I find myself being more aware of my body's movements due to the routine's slow natured exercises. In addition, I love that my muscles are far from being used to this type of movement! For example, my legs have never known relevé squats up until now. And the benefit of not being used to tippy-toeing through my squats is that my muscles become "confused", and those that haven't been worked on before are now working double time. I know many of us think that this is a vain motivation, which in a way, it is. But hey, I'm getting married in 10 days and I want to be as strong and fit as possible! Oh yeah, hello Kauai!!!!! Here we come! Initially I thought that it was all in my head and that I was tricking myself into feeling longer and more poised. Although I've always had pretty good posture, I've noticed that my frame looks more shapely and tight all around. To top it off, my calves seem to have slimmed down a bit, but in a good and healthy way. I'm not talking about my calves suddenly becoming skinny. What I mean by slimmer calves is that the muscles have found their "proper place", which in turn, makes my calves feel and look seemingly toned. Although these changes seem trivial especially when no one can see them with my clothes on, it's really noticeable for me when I look in the mirror. Basically, Ballet Body is not the end-all in our pursuit of fitness, in my honest opinion. I believe that we still need cardiovascular health just as much as we need strong muscles, so it's really a matter of personal choice when it comes to what kind of training we follow and how much of it we do. Most importantly, it's about finding that balance between everything that we make our bodies go through. I am slowly becoming a huge advocate of mixing things up, like going on an intense/leisurely hike, while another day you will find me pumping iron at the gym, and the next day I'll be running like a mad woman and cooling down with soothing yoga stretches. I realize that the things written above are pretty much focused on the physical. However, I want to share my thoughts on my spiritual life as well. Lately I've been finding myself getting a little more anxious in regards to my appearance, the amazing and numerous changes I'll be going through with Greg, and so many other things that are too personal to openly bring up on a blog. When it comes to my physical image, I've had my great days and I've had my bad days. I think the fact that I'll be getting married in just a matter of days brings up some insecurities every now and then. Obviously, I don't think that wanting to be beautiful and look my best on our wedding day is a sin! Not at all. However, I've noticed that I need to watch my thoughts as they can easily creep up and become negative ones rather quickly. This means that God wants us to constantly pray because we are not fighting a battle against what we see, but what we don't see! Nothing is too insignificant to bring up to Him because He's God, and He can handle our baggage. I believe that there's always a reason why we come up against a wall or times of fear in our lives, and that's because we're God's beloved, and He wants to do a great work in us. Just as iron sharpens iron, we are constantly being sharpened by God and those around us so that we will become people who are more beautiful on the inside. And you know what? I think it's true when people say that the more beautiful we are on the inside, the more we shine on the outside. Although I have my times of struggle, instead of feeling condemnation for actually struggling, I'm learning to hand those thoughts over to God and be thankful that I actually struggle. Struggling with something is a sign of life, and it's a sign that we care--because if we didn't struggle, then that probably means we don't care to grow in our character. As I'm typing this out, I'm receiving a simple but invaluable revelation. I need to be consistently reminded that there is so much more outside of myself. Not to belittle my own emotions, but I realize that it's so easy to take my eyes off of God's mission for my life: to know Him and make Him known. Now my question to you is, do you know the joy of having Jesus as your Lord and Savior? Or...do you feel like you're at your happy place in life, in general? Have a great day filled with joy and blessings!